If your prints have been sitting in a drawer or a shoebox for the last decade, they’re probably looking a little worse for wear. The two biggest problems you’ll face are blemishes (such as scratches, dust spots, tears, and smudges) and faded colors. But with the help of an image editor and some third-party software, you can do a lot to restore some of your photos’ original beauty. Most scanning utilities will take a stab at removing dust and minor scratches from your images. For flaws they miss, iPhoto’s Retouch tool is a good second line of defense. To use it, switch to Edit mode in iPhoto, click on Retouch, and then click once on the offending spot. iPhoto will fill in the area with its best guess at what should be there. If Retouch doesn’t solve the problem, you may need to pull out the heavy artillery—Adobe Photoshop or Photoshop Elements. Both offer a collection of useful tools for masking image flaws, including the Healing Brush and Patch tools. My favorite choice for minor flaws is the Clone Stamp tool, which lets you replace dust spots and nicks with pixels from another part of the image. With the Clone Stamp tool selected, choose a brush size just slightly larger than the imperfections you’re trying to fix, and then option-click on an area in the photo that has the same tone and color as the section you’re repairing. This becomes your sample area. I often find that the best sample area is located right next to the imperfection. Next, center the tool over the flaw, and click once. If you don’t get a complete repair the first time, keep clicking until you do. To sample a new area of the image, option-click again; the Clone Stamp will then use that area for your repairs. Correcting faded colors is a bit more complicated than correcting a color cast (something iPhoto, Photoshop, and Elements all do pretty well). That’s because light and ozone affect different colors in different ways. One of the easiest ways to restore faded color photos is to use a Photoshop plug-in designed specifically for that task. My favorite is the $50 ColorWasher 2, by Photo Wiz ( ). ColorWasher does a great job of restoring faded colors in scanning projects (see “In Living Color”). Its Easy mode guides image-editing novices through the restoration process, and its Advanced mode allows more-precise corrections. 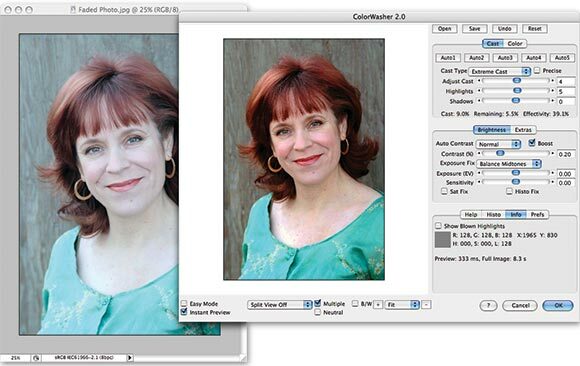 In Living Color: ColorWasher makes easy work of restoring vibrant color to faded photos. Many of us have negatives and prints of the same photos. In most cases, you’ll get the best results by scanning the negative. Prints are second-generation interpretations of your negatives. Often those prints have been made in one-hour photo shops, and they’re probably not of the highest quality. Plus, negatives tend to degrade more slowly than prints, so they are likely to be in better shape. However, if you made your own prints in a darkroom and the prints are still in good shape, you may want to scan these instead of the negatives—especially if you’ve manipulated the image with dodging and burning. You don’t want to lose all of your hard work by reverting to the original negative. Dust is a good scan’s worst enemy. You’ll save yourself a lot of frustration by making sure your source material is as clean as possible before it goes on the scanner. The best way to do this is to wipe prints with a lint-free photo cloth, starting at the top of the image and pulling straight down. No need to press hard—a light brush should be enough to sweep off the particles. Cleaning slides and negatives is a bit trickier. Start by blowing off any loose dust with a bulb blower (canned air can leave harmful propellants on your film). If particles remain attached because of static electricity, you can purchase an antistatic brush to wipe lightly on the surface. But err on the side of gentleness. It’s better to remove the flaws later in your image editor than to risk damaging your precious originals. Since you’re going to the trouble of scanning, why not also use this opportunity to get those precious mementos organized and adequately protected once and for all? As you finish scanning, place each print or negative in a photo-safe sleeve organized in a binder. (Sleeves typically cost about 25 cents per page.) Most brands of sleeves, such as Print File Archive Preserves, provide room along the edges of the sleeves so you can add information such as the date of the photo and, in the case of this project, the file name of the scan. This is a great way to match up your hard copies with the file name for the corresponding digital image, saving you precious time if you need to rescan for any reason—or if you just want to hold the original in your hands.